While in middle school, my brother and I would often press our grandmother to tell us a story. Not any story, but a particular one from One Thousand and One Nights. I don’t remember the details, except it was about a clever royal minister. But it wasn’t really the content that pulled us back to this tale; it was the way our grandma narrated it — modulating her voice, colouring the details with her facial expressions. This is the essence of oral storytelling — the capturing and relaying of characters, places, scenes through the unique lens and voice of each individual storyteller. 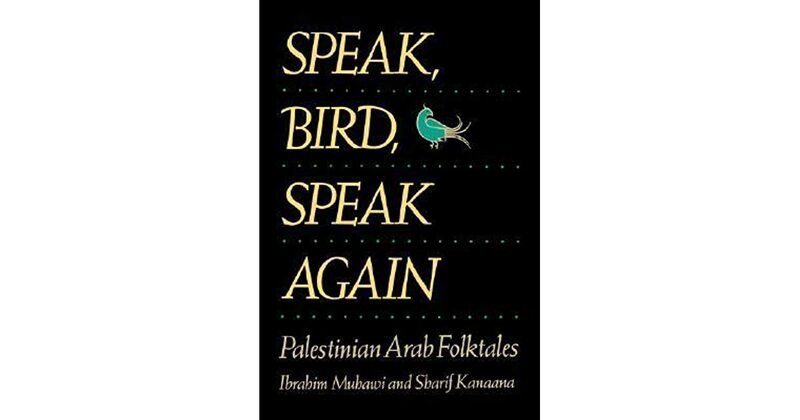 Given how difficult it is to transfer the drama and verve of the spoken tradition to print, the authors of Speak Bird, Speak Again— a collection of Palestinian folktales — have done a worthy job of conveying that flavour. In the late 1970s, two Palestinian scholars, Ibrahim Muhawi and Sharif Kanaana, set out to collect Arab folktales from Galilee, Gaza and the West Bank. Their search resulted in the book comprising 45 such tales. The storytellers were mostly women. “The most common setting for taletelling was the small family gathering, consisting of two or three mothers from a single extended family and their children…” The stories were usually told after supper during long winter evenings when field work was at its minimum and folks liked to huddle indoors. To make the story — usually fantastical — more accessible, the teller would often compare characters from a story to someone in the neigbhourhood. The community, then, is the natural pivot around which these entertaining stories turn, and sometimes twist. Of course, imaginary flourish abounds in the tales, but never without the context of one’s immediate bearings. And cultural parallels with our own South Asian community life are striking. There are wedding processions in which the couple’s relatives and friends dress in finery and sing and dance in the street. There is even the practice of a girl choosing her mate by throwing an apple or handkerchief over his head that is derived from the Indian tradition of swayamvara. Neighbours know each other for generations and come together to celebrate and grieve as well as to borrow and lend items of utility for hosting guests. “Because they were inviting the vizier, they borrowed a mattress from one neighbour, a cushion from another, and plates and cutlery from others.” Sounds similar to our neighbour lady knocking on our door when she ran out of sugar or me knocking on hers to borrow some ice, for we had no fridge. Food, of course, is at the centre of this hospitality. Cabbage rolls stuffed with minced lamb, ghee, rice and spices; the simple fare of leavened bread, yogurt, olives and fresh vegetables; Palestine’s national dish, za’tar — a condiment made by grinding together herbs, roasted wheat and garbanzo beans; or the poor farmer’s lentil soup add as much zest to the region’s folktales as they did to its primarily agrarian society. In the story, Sahin — a vizier’s clever daughter — steals food — roasted rabbits, partridges, gazelles — prepared by a young man from right under his nose to share with her girlfriends day after day, leaving his hardworking brothers to manage their supper cooked with leftover ingredients. That the creators of these tales weren’t shy of introducing atypical female characters have made the stories lively and real. Despite the region’s deeply-entrenched patriarchal system, we meet the clever daughter of the vizier in Sahin and in Soqak Boqak, a king’s wife who mounts a horse as she goes in search of a bride who fits her son’s choice and description. There are angelic women — indulgent mothers and motherly sisters, loving wives and affectionate daughters — and there are regular, everyday women — possessive mothers and jealous sisters, selfish wives and cunning daughters. In these stories from Palestine, the clever and the beautiful, the devilish and the pitiable merrily join the supernatural — jinns, ghouls, and residents of the netherworld. The resulting whirl sweeps the listener/reader to a realm suspended between what is and what-you-wish-could or would-not, be. Seemingly magical, which by implication is unreal, this dimension subtly shines a light on the underdog and even breaks stereotypes. Half-a-halfling, the crippled son of a king, despite being ridiculed and humiliated all his life, comes out a winner in the end because of his intelligence and compassion. And ghouls and ghoules, who appear (and disappear) constantly, aren’t always ghoulish in their deportment — depending on how one treats them, they can be benevolent or beastly. In The Green Bird, my favourite story of the collection and the one from which the book derives its title, the love of a sister for her brother is amplified by the poignancy of the brother’s death at the hands of their stepmother and the sister burying his bones, which help him turn into a bird who reveals to the world the stepmother’s atrocities and delivers justice in the end. Everyday occurrences in the world we inhabit are sometimes more bizarre than what a fabulist can ever spin into a story, and the implicit allegory of these Palestinian folktales can’t be overlooked. In a recent episode of container politics, the leader of a political party in Pakistan and his followers protested against the current regime from a “container” — a luxury bomb and bullet-proof truck furnished with beds, washrooms and air-conditioners. When I read a report about the container being fired upon, I recalled a scene from Half-a-Halfling. In the scene, the crippled young hero is on a mission to defeat a ghoule. Given how greedy the latter is, he approaches her with a huge box filled with halvah. She asks him the price of the dessert and keeps buying and eating it, unable to satiate her appetite. That’s when Half-a-Halfling suggests she get inside the box so she could have the whole container to herself. The ghoule’s greed precludes her from understanding the risk associated with this, and she jumps inside the box. As she busies herself with devouring the rest of the halvah, Half-a-Halfling brings her to his village and tells the villagers to alight the box. Greed, thus, costs the ghoule her life. Screens and gizmos of varied shapes and colours have now replaced the playground in many developed and developing countries. Folktales and their telling might appear obsolete. Or maybe not. A friend told me how, on a recent trip to Latin America, her five-year-old daughter was shocked to discover that a girl younger than her had no playroom with toys stacked up to the ceiling. “That’s all they have,” my friend told her when they visited the other girl’s jammed-but-toy-less two-room house, packing eight family members. For many Palestinian children, a proper house — even a crammed two-room one — could be a luxury. Listening to stories — with fantastical twists and happy culminations — might be the only sky on which their hopes can fly.